Re-opening Dec. 3, 2016, the Riu Palace Cabo San Lucas will feature new amenities for your clients to enjoy including new Swim Out Jr. Suites (with private pool), Indian cuisine restaurant, terrace-solarium, 24-hour lobby bar, additional Chill Out lounge bar and cappuccino corner. The hotel is situated in the south of the Baja California peninsula, directly on the beautiful, snow-white, sandy beach. Awarded a 2016 Certificate of Excellence by TripAdvisor, Riu Palace Cabo San Lucas is a superb all-inclusive resort for all ages. At Riu Palace Cabo San Lucas, your clients can enjoy delicious cuisine. Included in the all-inclusive package are all meals and snacks that combine Mesoamerican and European gastronomy as well as many others. Drinks service at the pool allows guests to completely relax all day while never leaving their poolside chairs. Room service 24 hours a day enables those looking for complete privacy to be pampered without ever having to leave the room. Your clients will also find numerous sports and activities to enjoy during their stay. They can go diving, play volleyball, windsurf, set sail on a catamaran, kayak, take advantage of one introductory scuba diving lesson in pool, and so much more. Kids can enjoy “RiuLand,” where they can participate in supervised activities. Your clients can bring home a unique memory of this marvelous destination. 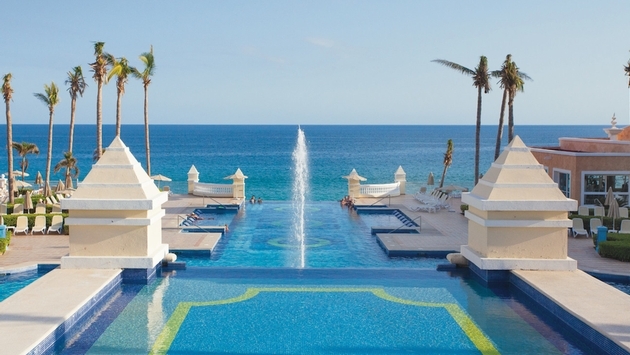 Send them to Riu Palace Los Cabos, where they can enjoy spectacular beaches and an amazing view. Joe Jiffo, a seasoned travel industry executive is Vice President of Sales and a senior leader of Exclusive Group Travel, a tour operator and travel agent only brand specializing in individual and group travel to Mexico, the Caribbean and Central America. His primary role is to oversee the sales development of the business development managers and inside sales support team as well as establishing and maintaining travel agency relationships and new business development. Jiffo previously served as vice president-business development for Ensemble Travel Group, where he was responsible for the North America Business Development team and new member growth and retention for Ensemble, as well as work to strengthen Ensemble’s cruise portfolio and partner relationships. His nearly 20 years of experience in the cruise industry includes senior sales positions at Celebrity Cruises, Royal Caribbean International, Carnival Cruise Line and Norwegian Cruise Line. Jiffo holds a bachelor's degree from Widener University in Wilmington, DE. He is a Certified Travel Counselor (CTC) and Master Cruise Counselor (MCC). Originally from Long Island, NY He lives in Weston, FL.